I was very fortunate that I could see this movie on its premiere date in Indonesia. I have already purchased the ticket since last Saturday and aimed for the 5.45 PM show at Epicentrum XXI which had a Dolby Atmos sound system and a very large screen. This time my wife did not accompany me as she had other events that she had to attend to (plus she was not a major fan of Star Wars anyway as she had not seen the complete movies). Well, let us get on to the movie. The story started not too distant from the ending of Star Wars episode VII. The main plot of the movie would revolve around the Resistance led by General Leia (Carrie Fisher) who had to carry on with the war against the First Order led by Supreme Leader Snoke (Andy Serkis - Gollum in The Lord of the Rings trilogy and Caesar in new Planet of the Apes trilogy etc) with his right hand man general Hux (Domhnall Gleeson - American Made, The Revenant etc) and trusted "student" Kylo Ren (Adam Driver - Girls TV series, Lincoln etc). Leia had the support from Commander Poe Dameron (Oscar Isaac - X-men: Apocalypse, A Most Violent Year etc) who was reckless but reliable. With the heavy chase by First Order, Poe was lucky that Finn (John Boyega - The Circle, Detroit etc) together with a girl working in maintenance named Rose (Kelly Marie Tran) would be giving a solution to their biggest problem. Meanwhile, as we already seen it earlier, Rey (Daisy Ridley - Murder on the Orient Express) indeed met with Luke Skywalker (Mark Hamill) to request his help in assisting the Resistance fight First Order. So how would everything unfold? Would the Resistance be able to fight The First Order? Would Rey be able to convince Luke to help Resistance? Find them all in this great action adventure fantasy movie. What can I say? I was totally satisfied with the movie. It was exciting to see everything throughout the movie. From the start of first 15 minutes it already was very intense. Apart from some slower pace drama combined with brief action here and there, the rest of the movie was totally awesome. From the middle till the end, it was almost constantly full of action, but not the kind that was making you strapped to your seat, but more like a "cannot wait to see the next thing that would happen" kind of actions. Despite not having a jaw dropping surprising twist like in Star Wars: Force Awakens (the moment when we found out who Kylo Ren was and what he did), the movie still had some surprises as well. And that climax? OMG, that was one of the best climax I have ever seen in a movie. Definitely worth the wait. My most favorite thing about this one was the fact that the movie was quite loyal to the original Star Wars movies. In fact I felt there were some similarities with The Empire Strikes Back (those who have seen it would know what I mean), especially with the appearance of a surprise character. Even though I am not the fanatic Star Wars fans, I still love the original characters from the movies. This time, I got to say that I like the new characters of this trilogy. I love the characters of Finn, Rey, Poe and I loved the new droid BB8 whom I think was very refreshing. I even like/hate Kylo Ren's character. Oh and the new characters in this episode, i.e Rose and Vice Admiral Holdo (played by Laura Dern - Wild, Jurassic Park etc) were remarkable. Though personally I am very disappointed with Snoke. The special effects by Industrial Light Magic as usual never failed. Those space war scenes and the final scenes were amazing. However, I am a bit disappointed with the creatures effects. I do not know why but those cute creatures in that island seemed unreal and looked really robotic and some of the aliens species did not seemed believable which was quite a let down from the previous Star Wars movies. The musical effect was done nicely and really felt they were made for this movie. The sound effects were good but oddly not spectacular. There were some funny moments that would make us laugh and there were few touching moments before the end. The length of the movie was just nice even though it was 2.5 hours. It did not feel boring and even children below 10 years old who saw this movie with their parents were able to see the movie till completion without complaining of boredom (if anything, their only complaint was having to go to the restroom). There was no end credit scene to this movie just like in all other Star Wars movie. It did give you the nostalgic feeling of listening to that special Star Wars music. And there was a brief lovely tribute to the late Carrie Fisher (some of the audience also clapped their hands when they saw this part). Overall, I personally felt that this Star Wars movie was awesome. Though not the most perfect movie, but it is certainly up there. And I really really REALLY cannot wait to see the final episode of this trilogy. 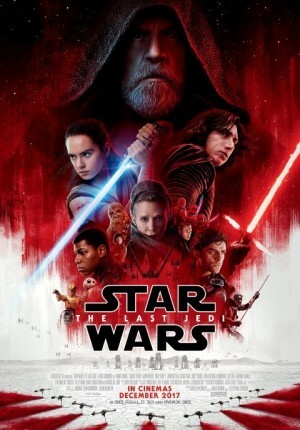 I truly recommend all of you who love Star Wars to see this one in the theater as soon as you can. Those who are confused of why Star Wars could be so phenomenal should start watching the previous episodes to understand the reasons and see this one immediately.